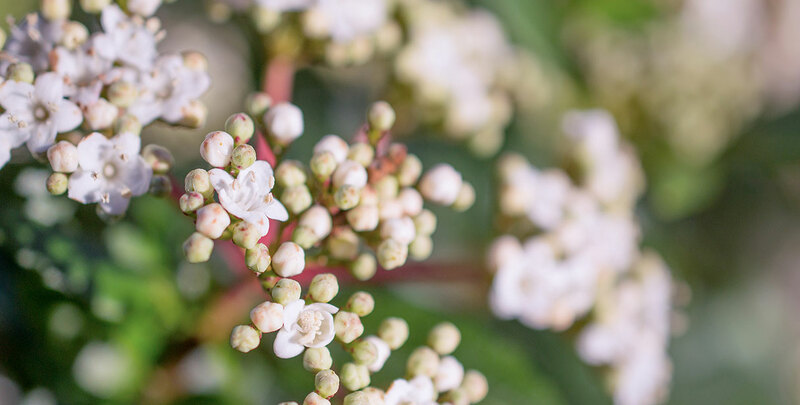 Viburnum tinus or, as most people prefer to call it, laurustinus, is an evergreen flowering shrub of the Adoxaceae family. Although it originates from warmer areas, specifically the area around the Mediterranean Sea, it can adapt surprisingly well to a colder climate, such as here in the UK. As laurustinus has a natural preference for shady, moist locations, the wet conditions in our maritime climate are perfectly suitable for this species. 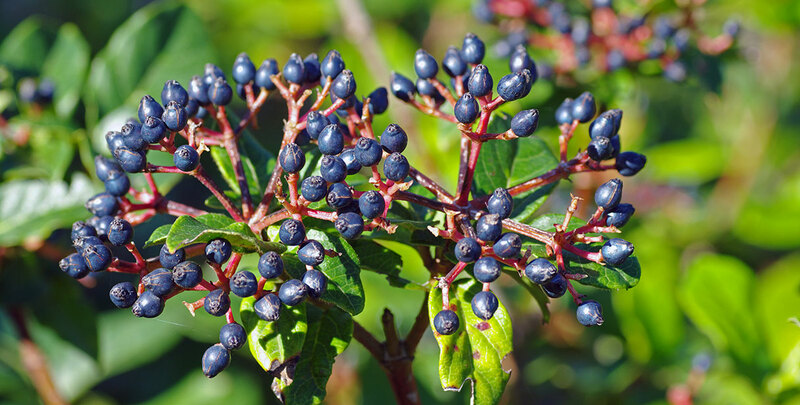 Laurustinus is mainly loved for its handsome, glossy dark green foliage, its lush, fragrant white flowers and the dark blue to black fruits that follow. It makes a nice informal hedge and is ideal for borders. 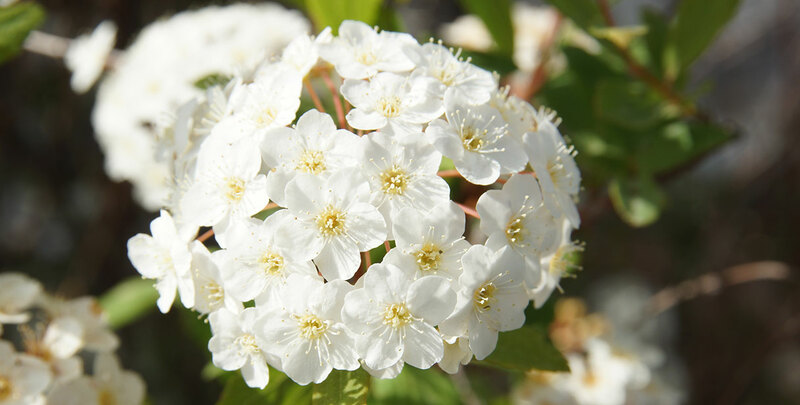 As it does well in the shade, it is a perfect specimen to brighten dark spots in your garden. A striking feature of the laurustinus is its long flowering period, which starts in December, when the pink buds turn into clusters of white flowers, and ends in April. Its flowering is generally more profuse in the sunny spring than in the winter. Laurustinus is hardy and can cope with cold winters, but harsh winters may cause damage to its leaves and branches. However, winters harsh enough to do any damage to the plant occur only rarely in our part of the world and even if they do, a laurustinus hedge will fully recover when spring arrives. Laurustinus tolerates exposed sites and seaside gardens. 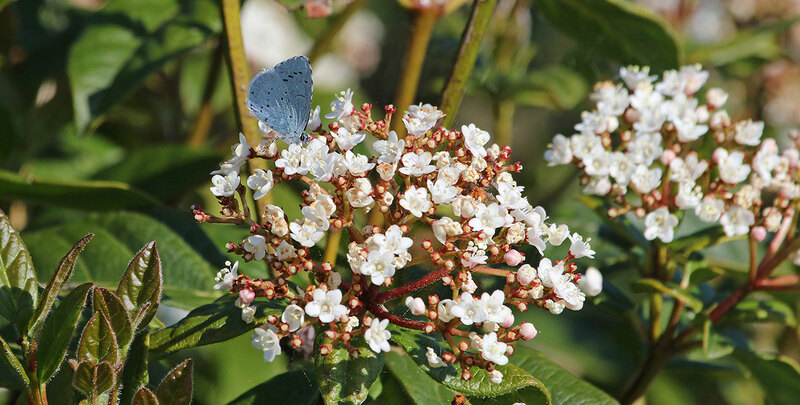 In fact, its long flowering season makes the species stand out among the admittedly relatively limited selection of hedging plants suitable for coastal gardens. The history of the laurustinus goes back a long way. When the well-preserved snow mummy Ötzi was discovered in the Alps in the early nineties, he was carrying a quiver with arrows fashioned from laurustinus wood. Since he was estimated to have lived over 5,000 years ago, this discovery provided the evidence that the laurustinus has been with us for a long time. It was appreciated for its appearance early on, as it was one of the very few plants that would remain green and even flower during the cold season, when most other plants and trees would look somewhat monotonous. It was also used medicinally, as several parts of the plant work very well as a laxative or an antipyretic. A laurustinus tincture is used as a component in herbal anti-depressants to this day. As Ötzi had already proven, the wood of the laurustinus was often used to make weapons and tools. These days, its wood is not commonly used and the species is most often planted for its ornamental value. Spring will simply arrive early in any garden with a laurustinus hedge, as it already starts flowering during the winter months. The fact that the laurustinus is relatively easy to maintain has undoubtedly contributed to its popularity as an ornamental plant as well. As stated before, its tolerance of shade makes the laurustinus an excellent plant for brightening up dark spots in your garden. For this purpose, it is often also planted as a free-standing shrub instead of a hedge. It makes excellent informal hedges, though it should be noted that its relatively open growth habit makes it unsuitable as a privacy hedge. A laurustinus hedge has an average growth rate of 20 to 45 centimetres per year and reaches a maximum height of about 3.50 metres. Younger plants will grow much faster than older plants. While this species is not very picky when it comes to soil type, a laurustinus hedge is best planted in a moderately fertile, well-drained but moist soil and in a position in the full sun or semi-shade. This hedging plant will grow in full shade, but it should be noted that such a position will reduce flowering. This is something to take into consideration, as most people choose to plant a laurustinus hedge because of its flowering. It is hardy up to about 12 degrees of frost. If temperatures drop below that however, it is important to protect the roots against frost damage. However, laurustinus hedges are known to recover from frost damage and respond very well to being pruned, though we would like to point out that hard pruning is not beneficial to the flowering of this species. The best time to prune this winter flowering hedging plant is directly after flowering, around early May. It is a fairly easy job, as all you have to do is remove its longest shoots. Some people claim that the laurustinus makes an excellent specimen for topiary, especially after its annual growth rate has slowed down. While it certainly lends itself for this purpose, topiary affects the beautiful open structure and the flowering habit of this hedge plant. Laurustinus is a very reliable hedging plant, which flowers when most other flowering hedge plants are not even close to flowering yet. As such, a laurustinus hedge is a welcome addition to any garden. It makes a beautiful informal single species hedge, but it can also be combined with other flowering hedging plants in order to create a mixed hedge that will flower for the longest time possible. In addition, a laurustinus hedge is very easy to maintain and will therefore offer you the longest possible flowering season for the smallest amount of work. This species is also one of the very few evergreen hedging plants that is able to handle positions in the shade or by the seaside. If those conditions are keeping you from planting a beautiful hedge in your garden, then laurustinus is the perfect hedging plant for you.